You want convert your powerpoint to flash file? Now you can do it for very easy and cheap. this software’s name is iSpring. 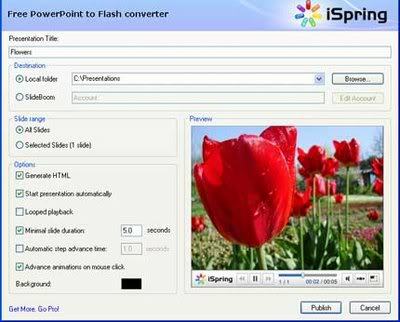 iSpring products are based on the innovative AccuPoint™ technology that provides best-in-class accuracy of rendering complex PowerPoint effects and animations into Flash and combines it with speedy conversion. The unique nature of AccuPoint technology is its support of Flash movies embedded into PowerPoint presentations, correct handling of animated GIF images, and capability to aggregate all presentation content, its player, and media resources into a single Flash (.SWF) file. This makes your presentations look and behave exactly as in PowerPoint.